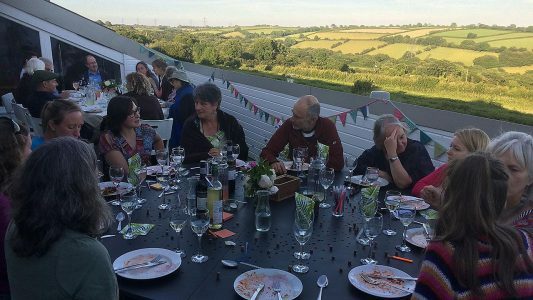 We’ve been taking part in an initiative developed by University of Plymouth, Regen and South Dartmoor Community Energy called Imagining Alternatives – Feasts for the Future. Building on the successful Community Energy Feasts Regen has organised in the past, the idea was to bring different groups together to reflect and celebrate together about what we’d like to see in our Utopian future of 2068. Tamar Energy Community held its feast on Friday 15th February at the Lower Deck Cafe, URC, Russell Street in Tavistock and 28 of us enjoyed a Vegan Feast provided by Blue Skies Catering. If you’d like to join us please book BY TUESDAY EVE- Feb 12th by registering here on Eventbrite. An important aspect of the Feast was the shared table which has been handmade by Devon craftsman Barnaby Stone. 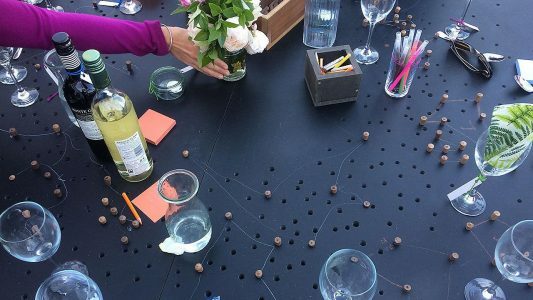 Everyone had a chance to sit at the table and leave their mark by creating their own pattern. The table has been to five feasts and a different sort of wood was used for each. We used this occasion to celebrate our achievements so far, chat about the future, and in particular how we can contribute to the challenges of significant carbon reduction by 2030 … Twelve Years! A summary of our ambitions will be available shortly.